Senegal, Mali, Burkina Faso, Niger, Libya, Italy: Ansou’s journey took five years. Five years during which he chained the odd jobs, masonry in particular. Five years of which he was detained for six months in Libyan prison or worked “for an old man, free of charge, in exchange for a bed”. Five years during which he never really projected himself until Palermo. Ansou is only nineteen years old. Young and already old. Last September, he run aground in Sicily, alone. Very quickly, Italian lessons, meetings and the library. In the shade of a pine tree, against a stone wall, he tells the essential role of the Ideas Box in its integration in Palermo. In March 2018, Libraries Without Borders set up its first Ideas Box in Sicily, in partnership with the Ministry of Culture and the Palermo City Council. The goal? Work with different local actors to promote the integration of young exiles; digital tools, board games and selected Ideas Box books allow you to learn Italian or write cover letters for example. Four months later, she gathers every day about twenty young migrants, mainly Guineans, Gambians and Burkinabe. And projects are multiplying : workshop on representations of migrants in the European press, production of a short film and production of a tourist map of Palermo. 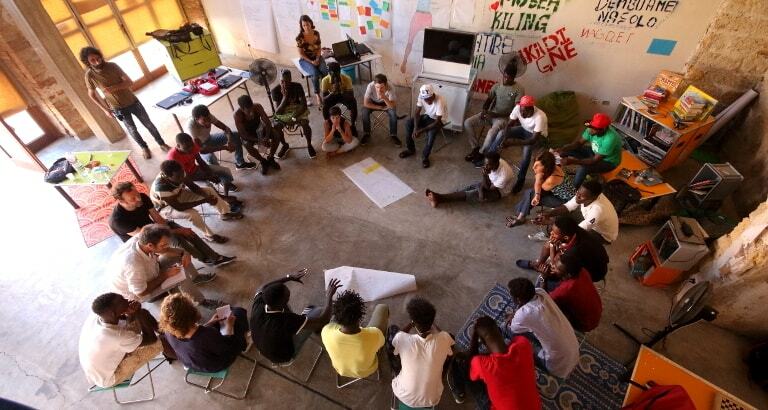 Led by a team of Libraries Without Borders – Federica, Silvia, Ousman and Chiara – the Ideas Box is located in the heart of the rehabilitated brownfield Cantieri Culturali della Ziza, where are among others present the French Institute, the Goethe Institute, the Academy of Fine Arts and the only public cinema in the city. “I met my friend Ousman playing football, not long after I arrived in Palermo. Since April, he has been a mediator at the library : it is thanks to him that I am here. I remember my first day here, I was calm. I observed a lot. One day, two days then three. I come now every day, I invest in every activity : if I’m not here, it’s because I’m sick. Since I go to this library, I have improved my Italian. Many do not believe me when I tell them that I have been in Palermo for only ten months. Some of my friends have been here for two years and speak less well than me. Most of them make more than one hour of bus to come. I also learned to use a computer. I knew of course how to go on YouTube but I did not know how to write a text. “This library helped me a lot. Thanks to her, I created new relationships that I never thought I had. It’s an open place that makes no difference. We are all equal here : Gambians, Guineans, Ivorians, Senegalese, Cameroonians, Nigerians, Malians … When we play together, there are no more nationalities ! 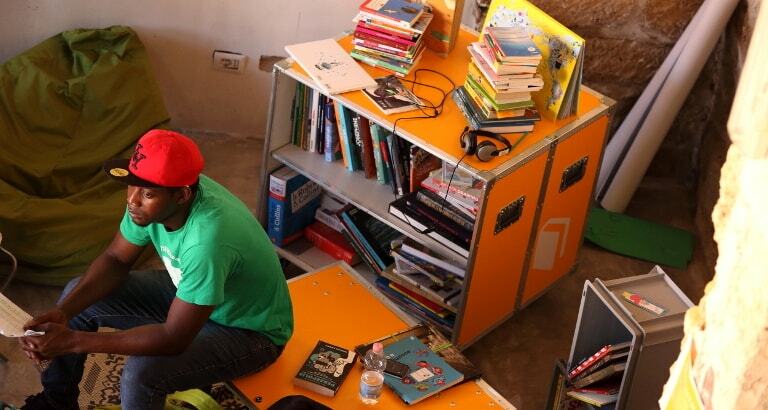 In Senegal, libraries are so different. Already, there is not all this equipment, like computers. And then if you borrow a book, you have to pay. Here it’s free. I would like to have this kind of library in my country. So many people want to study but do not have the opportunity. These libraries should be opened everywhere. Sicily, the gateway to Italy, concentrates 62% of exiled arrivals in the country even though it has an unemployment rate of nearly 60% among young people. With the Dublin agreements, the restoration of border controls and the end of the relocation program, thousands of exiles are now stuck in Italy.